Clth, 9 x 12 in. / 342 pgs / illustrated throughout. 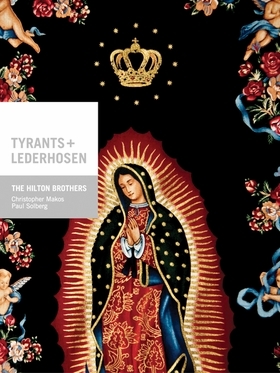 The Hilton Brothers are the photographers Christopher Makos and Paul Solberg. Their moniker is derived from the Hilton Sisters, the 1930s Siamese-twin vaudeville stars--and of course from the hotel heiress Hilton sisters of today. Makos is already famed as a portraitist of many of the twentieth century's leading icons, particularly Andy Warhol, Elizabeth Taylor, John Lennon and Man Ray; Solberg is a rising talent who made his name with The Bloom Book, his 2005 collection of flower photographs. Makos and Solberg's first collaborative monograph as the Hilton Brothers takes the form of a travelogue compiling works made by the duo from 2004 to 2011. Tyrants and Lederhosen opens with separate sequences by each of the photographers, which preface their globe-trotting anthropological collaboration as they document and narrate their travels from America to Europe to the Middle East and Asia. FORMAT: Clth, 9 x 12 in. / 342 pgs / illustrated throughout.